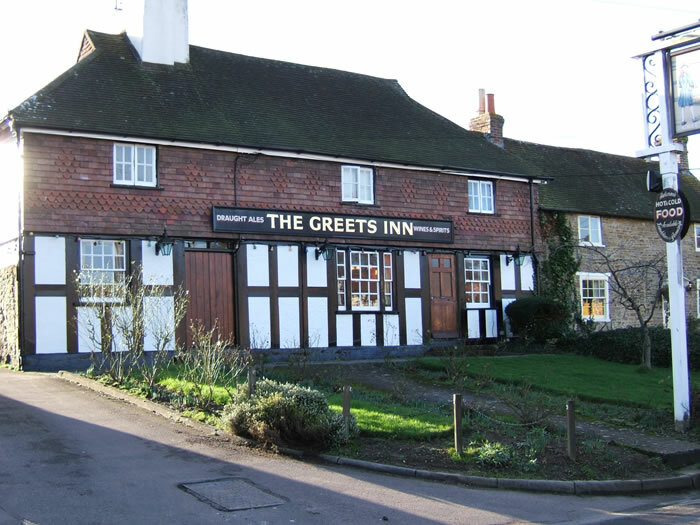 The Greets Inn is 13th century with three linked bar areas, an original flagstone floor and inglenook fireplace. The pub is well-known and can be busy. There is a small 'locals' bar but the rest of the pub is mostly geared towards dining. There is a large beer garden with barbecue at the rear. Beers vary but include Youngs and Fullers London Pride. The original landlady had 12 children and sold beer at a penny a pint to make ends meet. Unfortunately prices have changed since then. Rumoured to have a ghost who sits in the fireplace....if you think you have seen it, my advice is that it might be time to go home! Thanks to Pamela Chaplin for information about the history of the Greets. Turn left out of the pub and first right takes you towards the A29 [up a hill]. Turn right along the main road and left after 1.2 miles / 2 km past the Punchbowl Inn at Oakwoodhill. From Oakwoodhill, left again towards Rowhook, there is a great downhill section after the Chequers at Rowhook. Take care at the bottom, straight across the A29 again and back towards Warnham. Apart from the A29, there are some quiet lanes to ride near here.